Quick recap – Last month I started my first IVF cycle, short protocol of Gonal-F, Ganerelix and a Lupron trigger due to hyperstimulation. Since my progesterone was too high from being hyperstimulated we had to have a freeze all cycle. There were many immature eggs retrieved but we ended up with 4 day 5 blastocysts frozen. Fast forward seven days and AF shows up early. This is normal after a lupron trigger. The nurse went over the options of either a medicated, or “natural” FET cycle. I wasn’t keen on daily injections again if I didn’t have to. The nurse said the natural cycle would be one or two ultrasounds and daily blood draws (that I didn’t have to go to the center for) until LH surge, progesterone suppositories & transfer a few days later. So I jump at the chance to take a break from medications/injections, and the promise of only 1 or 2 appointments sounds great! Then reality checks in. CD 10 ultrasound shows no dominate follicle and lining only 5mm my hormones are very low. The nurse wanted me to go back the next day, I said I couldn’t take off from work, then they wanted the me to come in the day after that, I asked them if I could put it off until Saturday since my hormone levels show I wasn’t close to ovulating. The agreed and I had ultrasound #2, lining still thin, a lot of small follicles but nothing big yet. The have me come back 2 days later, I had to take off an hour from work. Ultrasound #3 shows a follicle getting bigger but still small, lining is growing but still not thick enough. The had me come back again (ultrasound #4) I had a very large follicle, 7mm lining but still on the thin side at the top. I started getting nervous about my lining, so I started taking 6g L-arginine supplements, more Vitamin E, drinking more red raspberry leaf tea, doing castor oil packs, basically anything I could think of that would help thicken it. The wanted to see me back again in 2 days, but they agreed to push it off until 3 days because of my work schedule. On my 5th ultrasound there was a 20 mm follicle on the left side, and my lining was 10.5 mm! The blood test on Saturday revealed my hormones had dropped a little bit which means that Friday I had my LH surge. My transfer is scheduled for Thursday! I requested it off with my boss today, & plan on going to the beach after transfer for some relaxation. I’m so excited to have our little embryo actually in my uterus!! I have such high hopes that this will work. 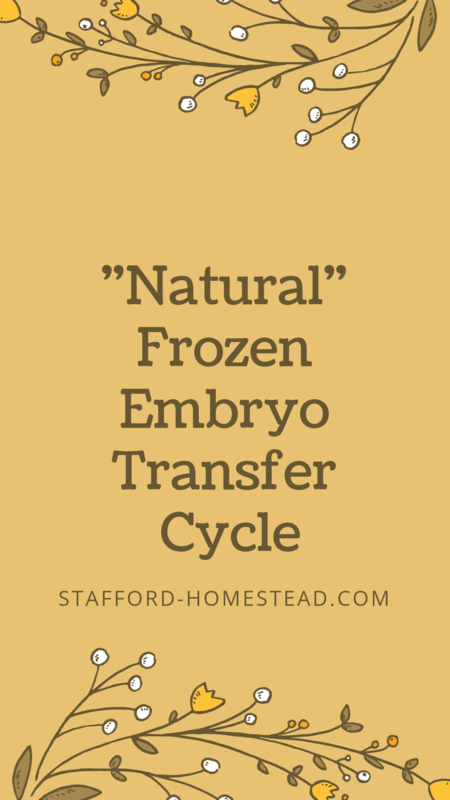 Previous Examining the Benefits of Frozen Embryo Transfer. Next What to Expect: Embryo Transfer Day.